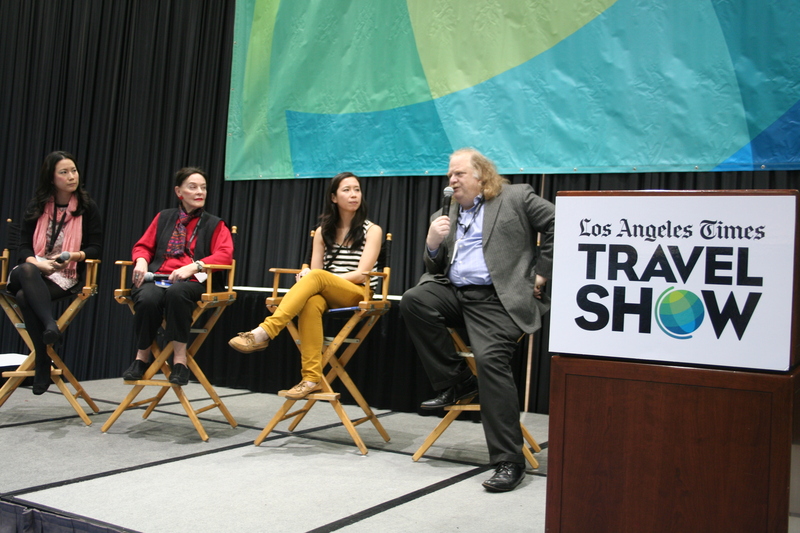 Los Angeles Times Food Writer Jonathan Gold along with a panel of food bloggers shared tasting tips for globe-trotting foodies at the 15th annual LA Times Travel Show, the largest event of its kind in the western U.S. The show brought together more than 22,000 celebrity speakers, travel professionals, industry leaders, members of the media and consumers at the L.A. Convention Center, February 22-24. Art and I would love to travel the world some day and so we trotted off to the Convention Center to be inspired. The five-acre show floor was filled with exhibitors from near and far offering travel services, products and advice, as well as show-only specials and giveaways. Attendees also were treated to live cooking demonstrations, fun activities such as a zip line, Bubble Rollers, repelling wall, a wild animal show and postcard-worthy photo ops. The food panel lead by the formidable foodie Mr. Jonathan Gold included: Cathy Chaplin, Barbara Hansen, and Tomo Kurokawa. Tip #1 — Visit the local market when you arrive at a new city. There you will find what’s fresh and in season. You’ll also have a chance to ask shoppers who live in the area where they go and eat. Tip #2 — Go to a butcher shop and/or the seafood stalls and ask them what meat is being raised or caught locally. This will give you a good idea on what to order when you go out to eat. Tip #3 — Use all of your senses and some common sense. Walk around the town and read menus, look inside the restaurant and see if there are customers enjoying the food, take a deep whiff to smell the food, and look at the food that is being served. If the restaurant is crowded, it smells and looks good, go ahead and sit down and enjoy a meal. Tip #4 — Do your research. Review travel/food blogs, articles in food magazines that feature the country or city’s cuisine. Sure, it gets a bad rap, but even check on Yelp. Learn about the top chefs and restaurants that are being covered. If you are finding that the same restaurant is being featured from various sources, the chances are the food is pretty good. Tip #5 — Budget appropriately and be adventurous! Plan in your travel budget at least one good, expensive meal at a popular restaurant where you’ve read about the chef and food. The other meal times, go and explore. Sometimes the best culinary experience comes from stumbling upon a little hole-in-the-wall, down an alley, off the main strip.